It’s no secret that the run-up to Christmas is my favourite time of the year. As soon as December 1st hits, my Santa hat comes out of storage, the office gets decorated (if any of my office mates read this, I’m sorry but also not really that sorry!) and my festive baking gets out of control. Even if you don’t celebrate any of the winter holidays, it’s impossible to avoid the avalanche of Christmas cheer around town. Trees and sparkly decorations everywhere, Christmas songs wherever you go, the crowds doing their last minute gift shopping, all the festive food… So if you can’t avoid the overwhelming cheerfulness, are there any fun things you can do in and around Glasgow to make the most of the run-up to the winter holidays? If you don’t mind the crowds, you can visit the Glasgow Christmas markets where you can warm up with a cup of hot chocolate, try some hot food from the many stalls and load up on sugar filled treats. My favourites will always be the Dutch pancakes, but I would never pass the opportunity to buy some Turkish delight to add to my sweetbread baking extravaganza. If you’re braver than me, perhaps you can even try one of the rides! Glasgow Christmas market. Image by Bianca Sala. A short trip on the train will get you to Edinburgh, with its own Christmas market filled with artisan products, a wide range of food and drinks, and a great amount of festive spirit. Add a walk around lovely Edinburgh to the list, and this makes one of my favourite short days out. You can have a go at making your own Christmas decorations, perhaps even some inspired by your research for our PGRmaking competition. If you still need some extra decorations (trust me, there’s always room for extra decorations), come along to our PGR Winter Crafternoon, where you can share festive cheer with your fellow students and eat a few too many festive nibbles. Being active in winter isn't all that easy, but there's ways you can have some fun while exercising outside. Have you ever tried ice skating? I am absolutely terrible at it, but I still find it great fun and love that you can have a go at outdoor skating at this time of the year. There’s an outdoor skating rink in Glasgow, and while it usually gets very busy it’s a great way to be active outdoors, and a good excuse to sample some of the sweets available at the aforementioned Christmas markets. Plus, exercising is known to boost your happiness and it’s great for some PGR self care! And why not exercise while wearing a Santa suit? The Glasgow Santa Dash is a 5K race where all participants are dressed as Santa, and this year’s one will take place on the 10th of December. Even if you can’t join anymore, or you’re not really into running, it’s fun to just go along to watch and encourage the Santas - I mean the participants. Carrying on the outdoor theme, nothing beats some snow around the winter holidays. While we usually don’t get that much snow in Glasgow, there’s usually some around the Highlands. Glen Coe is a two-hour bus trip away, and apart from snow you can enjoy the history of the place (albeit quite dark), soak in the amazing scenery and maybe try the slopes at the Glencoe Ski Centre. 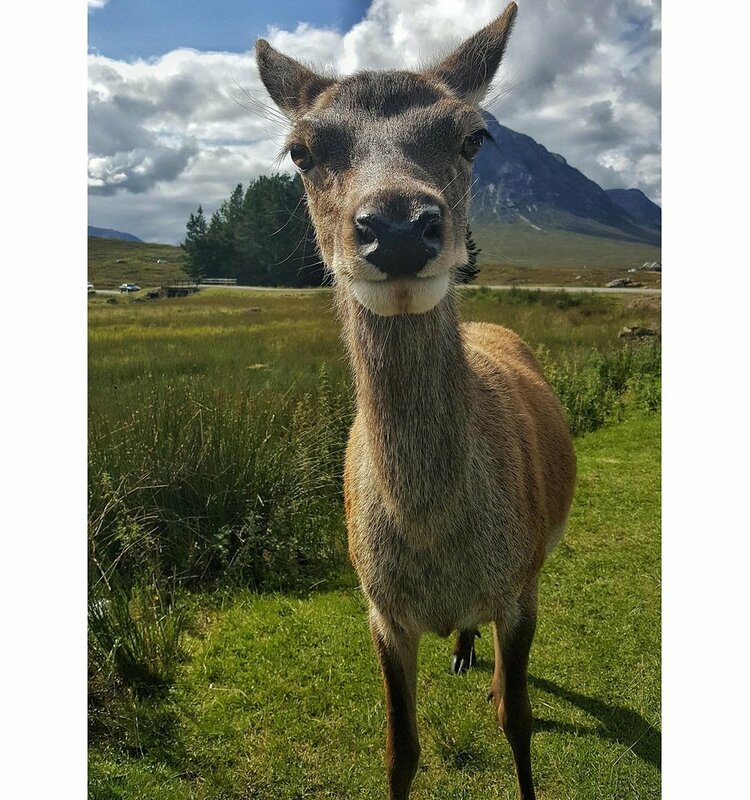 You can enjoy some traditional Scottish food at the historic Kingshouse Hotel, and if you’re lucky the famous deer will be about. They’re quite tame, and they’re usually quite fond of carrots (that’s all I’m going to tell you!). Making deer friends in Glen Coe last summer. Image by Bianca Sala. A slightly longer trip will take you into the Cairngorms, home to the UK’s only free roaming herd of reindeer. I can’t promise you’ll find a famous reindeer with a shiny red nose, but the reindeer herders are quite happy to take you to see them. You might need to book in advance, and given the time it takes to get there this would make an amazing weekend trip. I’ve not had a chance to meet the reindeer yet, but I’m keeping my fingers crossed I will bump into them soon on one of my trips! If you don’t feel like heading outside of Glasgow and bracing the weather in the Highlands, there’s also some festive shopping to be done! Maybe you still need to buy some presents for your family and friends. Or maybe you don’t celebrate the winter holidays, or can’t travel home this time (if you find yourself alone at this time of the year, check our self-care articles and remember that if you’re feeling lonely, there’s always someone available you can talk to). In that case, who says you can’t treat yourself to something nice? A new book to read while you’re taking a few days off from work, or a scented candle will brighten up any rainy Glasgow day. What if you don’t feel like shopping, exercising or getting out of Glasgow? There are many other festive things you can do in Glasgow, such as going to the theatre or seeing a pantomime. The Glasgow Loves Christmas website has a list of shows here, but there are probably many more smaller shows around town that are worth going to! UofG has a range of events planned in December, and not all of them are Christmas related if you want a short break from all the cheer! I hope this gives you a few ideas about what you can do in and around Glasgow before Christmas, and gets you excited and filled with holiday cheer. Merry countdown to Christmas! Do you have any other things you like to do at this time of the year, or any places you like to visit to get some fresh air and snow? If so, please let us know in the comments below or tweet us at @UofG_PGRblog.